Where did Tapas come from? 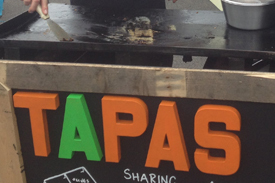 Tapas comes from the word Tapa “lid”. Andalucian innkeepers would cover the customers wine glass with dried bread to keep out the flies, they then came up with the idea of balancing a morsel of something tasty on top of the bread slice. A few cubes of cheese or ham for their customers to nibble on; and so the Spanish institution was born. Welcome to world of Tapas. Tapas gives a true feast for the senses that brings a little Spanish sunshine to a cloudy day. Tapas goes hand in hand with hospitality, friendship and plenty of good conversation. Let us indulge you with small mouthfuls of delicious savoury foods. The food for any occasion. Enjoy our traditional Tapas dishes served on table centre platters with traditional tapas bowls. Skewers of green & black olives, cornichons, anchovies with Piquillo peppers & cocktail onions. Chorizo and Parma ham slices, tortilla crisps, paprika & chilli mayo dip, olive oil & balsamic dip & sliced ciabatta breads. Patatas Bravas, crispy potato cubes served with a spicy tomato Sauce. Paella Verdura – Vegetarian: Our delicious vegetable paella made with Asparagus, Chestnut Mushrooms, Red Peppers, Chickpeas and Green Beans with a stock seasoned with Rosemary as standard. All our paellas are generously laden with only the best quality meats, seafood & vegetables. Mixed with red peppers, green beans, tomatoes and Paella rice.